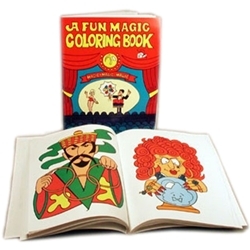 This magic coloring book kit includes everything you need to perform Royal Magic’s famous magic coloring book trick. For those not familiar with this classic trick, it works like this: A coloring book is shown to have all blank pages. With a little magic all of the pages are shown to now have pictures. However, it is obvious that the pictures need some color since they are all black & white. With one wave of the hand over the book, the pages are shown to have been magically colored! Now it is further explained that everything has been an illusion, showing all of the pages are blank again. The Coloring Book Kit magic trick includes magic coloring book, magic wand, and a set of vanishing crayons.